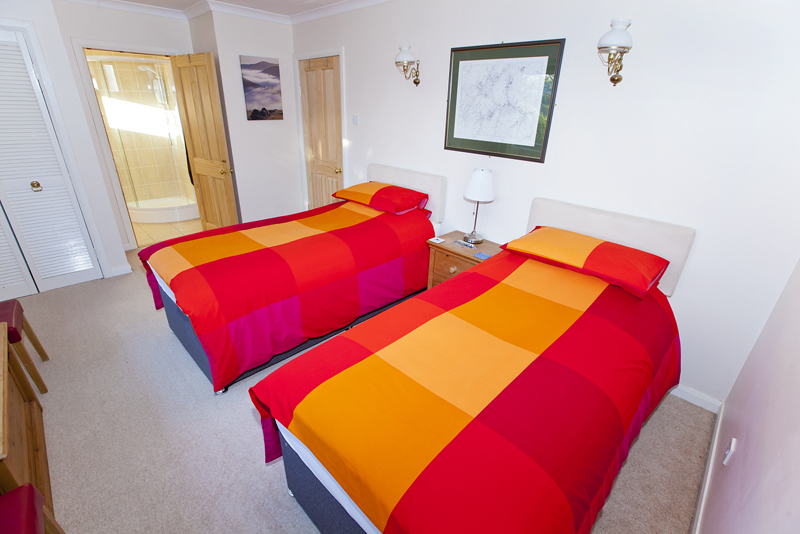 Our twin or double en-suite room, with its seriously comfortable beds and wonderful view across the Tweed Valley towards Traquair, is perfect to relax in after a long day on the trails, fishing on the Tweed, or just to wind down in after a long day. The room has coffee/tea making facilities, a hair dryer, a small safe, and a TV with Freesat and DVD player. Ample surge protected sockets and USB charging points are provided for laptops, tablets and mobiles, as well as free wifi. 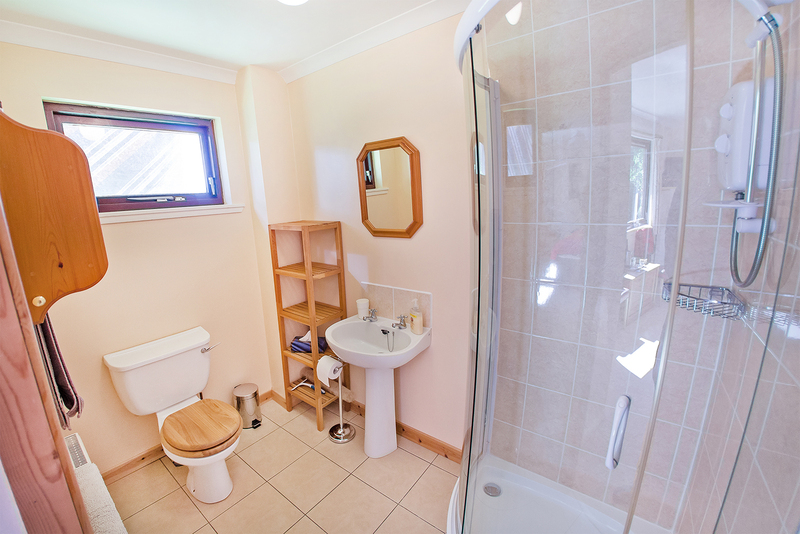 The en-suite has a walk-in shower and hand towels, bath sheets and a selection of toiletries are all provided. For cyclists, walkers and fishermen we have a drying cupboard for kit, clothing and footwear to make sure you leave here warm and dry the following morning, as well as secure bike storage with a bike maintenance stand and washing area. Please state when booking whether a double or twin is required. The en-suite is not available for single occupancy. 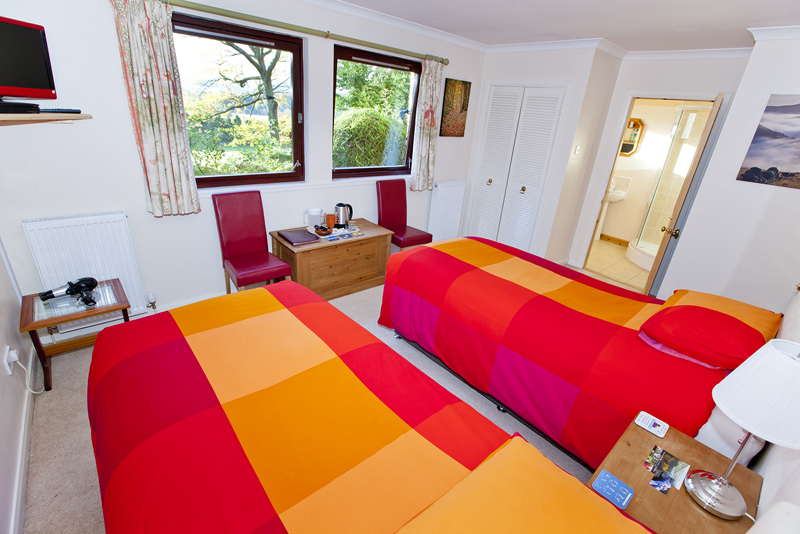 Same day bookings may be accepted – please telephone to confirm availability prior to booking. 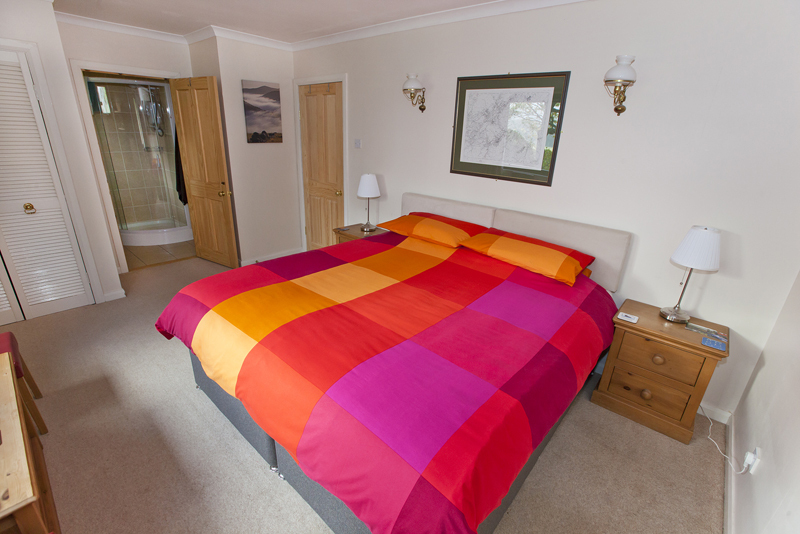 Each room has a single off-road private parking space available, and directions to Woodknowe can be found on our Contact Us page. To secure your reservation, a non refundable deposit equal to 20% of the cost of the stay is required after booking. Payment can be made by either cash, cheque or BACS - details will be emailed to you upon receipt of your booking. We reserve the right to cancel your reservation if the deposit is not received within 5 days of the booking being made. The remaining balance is due on departure. If a cancellation is made within 7 days of the start date of the booking, the deposit may be repaid at the discretion of Woodknowe if we manage to re-let the room(s). There is one private off-street parking space available per room. After making a reservation please email us to request any special requirements (e.g. Vegetarian meals). Unfortunately Woodknowe is not suitable for wheelchair access due to the number of steps down to the property from the road. We have a drying room available for footwear, jackets and other gear so mountain bikers, cyclists, walkers and fishermen can start each day warm and dry. Laundry services can be provided on request for a small charge. There's off-road parking, secure bike storage and bike washing facilities, plus a bike maintenance stand and a small selection of tools. We've added surge protected sockets and USBs in each room to charge mobiles, laptops and tablets quickly and safely. Packed lunches are available by prior arrangement - please ask when booking. Copyright © 2015 Woodknowe Bed & Breakfast. All right reserved.